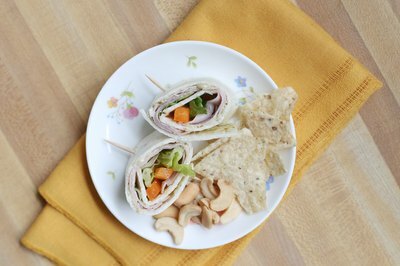 Pretty on platters, as well as a tempting treat for the picky eaters in your house, pinwheel sandwiches are less complicated to make than they look. 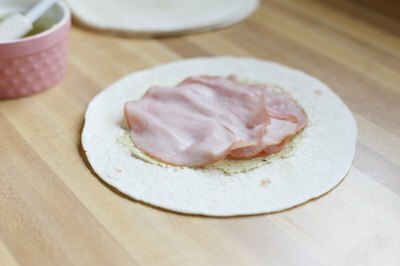 That's especially true if you start with an already pliable type of bread, such as tortillas or sandwich wraps. But even if you go the traditional route and use loaf-style bread, the circular, bite-sized snacks require little more than layering, rolling and slicing. 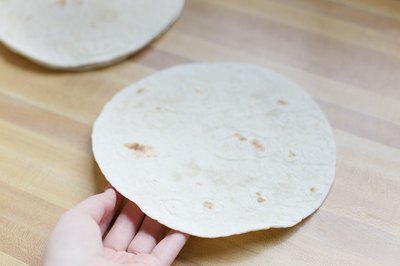 Lay a tortilla or sandwich wrap on a clean work surface. 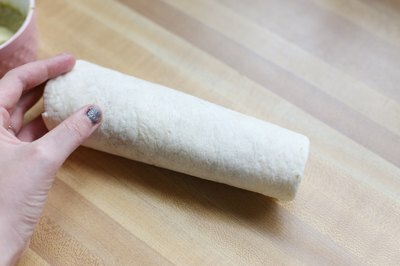 Alternatively, set down a piece of white or wheat bread, cut off the crusts and roll it out thinly with a rolling pin. 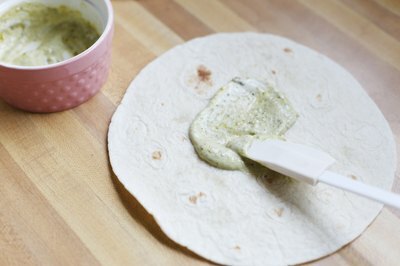 Tortillas and wraps roll up easily but don't have as delicate a taste as loaf bread. Crustless white or wheat slices, on the other hand, are flavorful, but a bit trickier to handle without tearing. Prepare your spread. If you're using a one-ingredient spread, such as hummus, cheese spread, butter or plain cream cheese, allow it to come to room temperature. Other options include mayonnaise into which you stir relish, mustard or chutney. Alternatively, whir cream cheese or butter in a food processor with grated cheese, chopped herbs, grated horseradish or finely-diced vegetables. Apply your chosen spread on the surface of the bread. Avoid spreading this topping all the way to the edges of the bread. Otherwise, the spread may ooze out of the bread when it is rolled up. Reserve a bit of the spread to use as a "glue" just before rolling, if you wish. Begin setting down your cold cuts or deli salads onto the bread. If you're only using one type of cold cut, such as roast beef or Swiss cheese, lay down two or three pieces. Otherwise, layer several pieces of sliced meat and cheese, or a thick layer of chicken, tuna or egg salad. As with the spread, avoid having fillings that are too close to the edges of the bread. 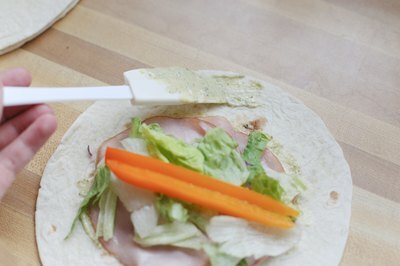 Put optional toppings over the cold cuts, keeping them in a flat single layer. Toppings can be leaves of lettuce or shredded lettuce, as well as sliced red onions or thin shavings of carrot, apple, jicama or cucumber. Keep in mind that any toppings need to be pliable enough to roll easily. Place an optional "pinwheel center" horizontally along the edge of the bread that's closest to you. This could be any ingredient that is naturally colorful and slender, such as a thin whole pickle, long strip of sweet red pepper or a scallion. 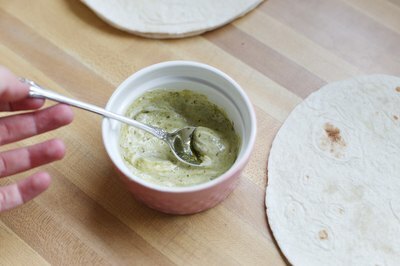 Once the sandwich is rolled and sliced, this ingredient will be the center of the pinwheel spirals. Dab a bit of spread along the top edge of the sandwich -- the one furthest away from you. 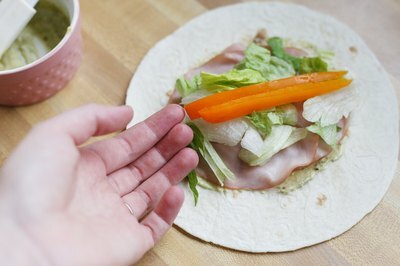 This will act as "glue" to hold the sandwich's seam together. Begin rolling up the sandwich tightly, jellyroll style. Start with the edge closest to you. If you've included a center pinwheel ingredient, roll the edge of the bread up and over this ingredient, then continue the rolling process. Continue making sandwiches until the bread, spread and filling ingredients are used up. 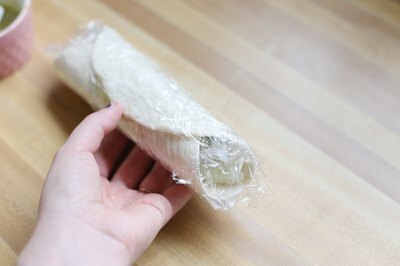 Wrap each sandwich in plastic wrap, then set them in the refrigerator for one hour. The chilled sandwiches will slice more easily. Remove the chilled sandwiches from the refrigerator and unwrap them. 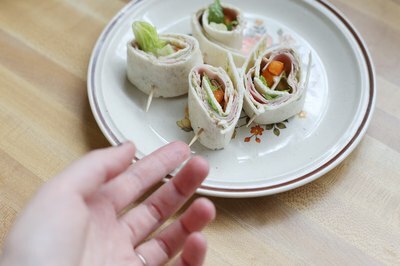 Slice them into 1-inch pieces, and set them, flat-side down, on the platter. If desired, skewer them from horizontally with a toothpick to keep each pinwheel from unfurling.